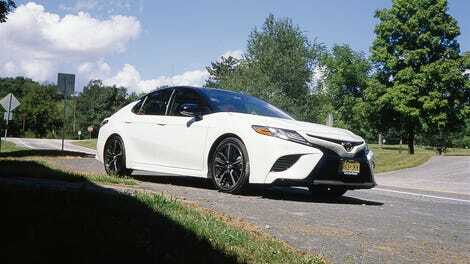 I spent a week in a nearly $40,000 2018 Toyota Camry with a red leather interior and 301 horsepower. It is one of the best cars on sale today. I’d call it an instant classic but for two minor flaws. I’m not sure how hot of a take I should go with to start out this review. Saying I had more fun driving this 301 HP Toyota Camry than I did driving the 365 HP Kia Stinger might be a good way to do it. But this is kind of a pointless comparison, as even I would get a Stinger if it was my money picking between the two cars. As I’d option them both, they’re about the same price, within a few grand of $40,000. The Stinger makes more power but the Camry is about 200 pounds lighter. What’s more, the Camry is just a better car. It’s roomier inside. It rides nicely (not something I can say, exactly, of the Stinger GT) and it feels resolute and normal in a way that the Stinger does not. Take off the engine cover on the Camry’s V6 and it looks like, well, a pretty normal V6. Take off the engine cover on the Stinger’s V6 and there’s tons of over-under intake plumbing that looks like something GM would make 30 years ago. When you’re in the Stinger, you’re in a serious performance machine with rear-wheel drive and turbocharging. You have expectations, ones that are echoed up your spine every time you hit a bump in the road. And those expectations aren’t really met on the road. The Stinger is... fine. It’s fine. I’m sure if you have the space, it’s great to rip donuts and figure eights or slide on a track. If I bought a Stinger, that’s where I would be. But that’s not how you drive 90 percent of the time. Most of the time you just drive to where you need to go, merging onto the freeway and getting off, then finding somewhere to park. In that world, the Camry XSE is king. In that world, the Camry XSE rips. I cannot overstate how silly 301 horsepower feels here. The whole car would be laughing on on ramps. I would be cackling as 18 wheelers would disappear in the rear view mirror. It hauls. Better, it feels like more power than the car can handle. Torque steer is everywhere. The tires squeal once the slow throttle finally requests full power from the engine and you teleport to the next intersection, waiting for the light to turn past yet another Pennsylvania strip mall. The silliness of having this much power in a Camry, so much more power than a Camry could ever need, it warms your whole body from the soul out. It’s like Bruce Wayne getting taught how to warm his chest before his arms and hands. And this is a cherry-on-top joy that you only get when the basic order of the car is good. You only get to really enjoy this car’s ridiculousness, its under-the-radar speed, because the bones are solid. I mentioned this car to my mom, because she’s the most practical person I know. Perhaps unsurprisingly, when the family needed a new car back in the early ‘90s, we got a ‘92 Camry, the most straightforward and well-built car of a generation. 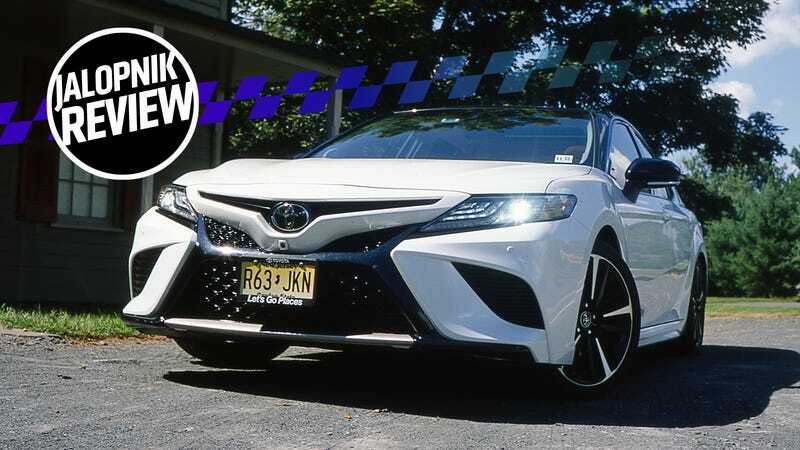 I brought up that the Camry was a silly car, because it was so wildly over-spec’d for its job of being a normal family car, what with the aforementioned 301 HP V6, a red leather interior, and a price tag of $38,750. She didn’t get why Toyota would go and make a Camry like this, and I didn’t get it either until I thought about it. The job of the regular family car is increasingly going to crossovers and trucks. When my mom was driving that ‘92 Camry around as a new car, the RAV4 was a niche offroader. The F-150 was a brick on wheels. So if the job of hauling people around is going to crossovers, the once-normal sedan has gone niche, and it needs some draw to get people in. Hence the shouty new face, hence the luxe interior, hence the silly engine. The Sedanocalypse is upon us. It has made the Camry this way, a specialty vehicle more than a normcore transportation vehicle. Seeing its death on the horizon, it has transformed into a warrior, and if it goes down it will go down with six cylinders ablaze and its front tires howling. This is where the Camry shines. It may be the most stereotypically American car you can buy, in that I have never driven anything that feels so wonderfully at home on the interstate. Anything that’s more comfortable feels weird. You can’t just drive a Maybach everywhere without feeling uncomfortable in some way, even if the suspension is better tuned. The Camry is built for this. The ride is exactly as I remember it on the family Camry from the ‘90s. It’s controlled but not even what you’d call firm. It is as soft as comfy as it can be without ever feeling floaty. No more, no less. Fuel economy was pretty good considering I drove it like a maniac all the time with a 3.5-liter V6 underfoot. I got just under 30 mpg over a couple hundred miles of town, country, and highway driving, with as much full-throttle action as I could get away with. The competency the car exudes up through the rather handsome three-spoke steering wheel starts to mess with you brain. Your foot finds its way to the carpet more often. In my Camry I am invisible. In my Camry I am fast. In my Camry I am the first on the road, the first to where I’m going. The road is for me. I am speed. Let God try and catch me; this Altima sure can’t. Oh right, the flaws. Other reviewers expressed the concern that this car’s traction control was always holding the engine back, that it could never really be turned all the way off. I booted the car as often as I liked and never felt like it was being slowed down, but it didn’t, like, blow its tires into clouds of billowing smoke with TC off. I then conspired to pull the ABS fuse to see what it would do at that point, but I quickly found that the two ABS fuses are kept tied together with a junction block fuse. Pull the ABS fuses and you pulled the junction block fuse, too, and that shut off the engine. The car wouldn’t start without the trio of fuses back in place. That’s a demerit in my book, though not, like, a particularly big problem for anyone who is not a total hoon. On the same thought, the car has an electronic handbrake. I won’t complain that you can’t get this thing with a manual because my heart has been broken and will never come back together, but not having a handbrake means that so many little gravel lots are just glimpses of lost potential looking back at you. No big slides for you, Camry XSE owner. No loopy rallycross runs. I once owned one of these big front-drive V6 ‘Yota sedans, a rare five-speed Lexus ES300. I rallycrossed the hell out of that car. It spun tires for days. I miss it. The hole in my heart that Lex left behind will never be filled by this Camry, but I shouldn’t hold that against it. The only real pain emanated from the screen in the middle of the dashboard. I will never really be happy with any route guidance or GPS that doesn’t let me plot out alternative routes like Google Maps on your desktop (but not on your phone, still, annoyingly), but Toyota’s system was particularly annoying. Anyone trying to tail me while driving from Harrisburg to Duncannon a simple drive north up the river would have had a hard time. Unrecognized construction at one intersection sent me and the GPS into an argument that got my buddy to pull out his phone, starting his own spoken Google Maps instructions going. This began a duel between the two navigation voices, leading the car to a number of legal-ish U-turns and digressions past closed carnivals and through local neighborhoods. About ten minutes in and the whole car was yelling, but we did ultimately find our way to 81 to 15, not that the Camry helped us get there. Honestly, this isn’t the worst system I’ve used. I remember driving a Jaguar XKR back when, and just giving up on any directions whatsoever and following signs back to NYC. Beyond that, phones never paired right the first time and generally anything you wanted to do with the car other than change the A/C or the volume was a procedure. The physical side of the interior was a joy, however, with comfortable seats and tons of leg room, particularly in the rear. I kept a six-footer behind a six-footer for a couple hours without complaints from either human. In fact, the only complaint about the car at all came from my coworker Mike Ballaban, a true connoisseur of luxury, who declared the leather “hard,” but otherwise loved the thing. I think a lot of it has to do with the sheer novelty of opening the door of a Camry and finding a gleaming red leather interior. My buddy Tirey said it brought him back to when his dad drove him around as a kid in a sky blue over blood red Pontoon Mercedes. Everyone’s eyes lit up when they saw this car. Oh! They’d all say, and remark about the color. Oh! They’d all say, when they looked up at the panoramic sunroof. Look at it. Look at it! A two-tone Camry that costs what you always think people spend on a BMW. At no point in the week did the surprise wear off. It was always a lark. Now, everyone who looked at this car had a kind word to say. I never drove it and came away disliking it. But if someone told me they got one of these things and eventually the power of the engine started to feel ordinary, that the interior started to feel stale, I would believe them. But I’d be surprised. This Camry felt built to last, and all of its little pluperfections just gave it such a character. It puts your conscience behind you and the devil in your right foot. Better said, it was a presence in every drive, entertaining and reassuring. That and it just plain worked. Cower before my merging prowess. Long for my red leather interior. A handbrake short of pure stealth overpowered FWD hoonage. Midsize family sedan, in the age of the crossover.